Do you have a bunch of keys on your keychain? Are you constantly trying to find the right key because they all look the same? Stat Key to the rescue! Stat Key is for those who recognize and enjoy a higher aesthetic standard. It is dedicated to freedom in design and robust but beautiful mechanical execution. The result is atypical – striking, elegant, and personal. What more could you expect from a company made up of aesthetes from different professions — industrial designers, engineers, and business people. Stylish and functional? Really, what more could you ask for? They’re about double the price of what you’d pay for a new key at a hardware store, but $5 for great design and ease of purpose fits squarely within my budget! Now that Fashion Week is over and the dust is beginning to settle, I’ve had a chance to think about the items I’d like to add to my wardrobe this Fall. While there’s sooooo much to choose from, I’m adopting a Keep It Simple Stupid attitude and baring things down to the essentials. I took a minute to think about what looks good on me and my personal style (incase you’ve forgotten, I’m a Disco Diva at heart!) – so while there’s lots of beautiful stuff to choose from . . . I’ve chosen classic items with a hint of 70s flare to round out my wardrobe this Fall. What about you, what are you fiending for this season? Fendi Top Handle Pony Hair Bag; Theory Poncho; Lanvin Court Shoes; Lanvin Leather Wedge Boots; and Theory Fox Fur Coat. Stubbs & Wootton slippers are staples in the wardrobes of preppy fashionistas from the UES (the Upper East Side in Manhattan) to Nantucket and Southern Belles in states like D.C., Virginia, the Carolinas and Texas. And now, they’re staples in the wardrobes of rappers like Kanye West (he spied them on a Yale undergraduate student at Barneys who he ended up hiring as one of his fashion coterie. Yes, he did!). If you don’t remember the lessons imparted by The Preppy Handbook or are too young to have memorized its dictates from cover to cover, what makes Muffy, Buffy, Biff and them preppy is that everything they do and wear and are about comes from old money. Although Stubbs & Wootton has only been around since 1993, somehow Percy Steinhart, the mastermind behind S&W, has been able to carve out a niche in the prepster world that makes owning the obligatory pair of his witty velvet slippers de regieur. Now, if shelling out $400 – $600 (the Bespoke line where you get to choose each element of the slipper) is a little rich for your blood, JCrew, Zara and ASOS all have their own versions priced between $75 and $300. Get ready to embrace your inner prepster this Fall! I got married in The Mexican Riviera on one of the hottest and most humid days of 2009. Like any Type-A destination bride (all brides are special but destination brides have a tendency to take special to the next level because there’s so much they have to give up to chance), I’d met with and was made up by a great make-up artist here in New York, Karen Duncan, to create my wedding face. Unfortunately, Karen had a previous engagement and wasn’t able to come to Mexico for the festivities. 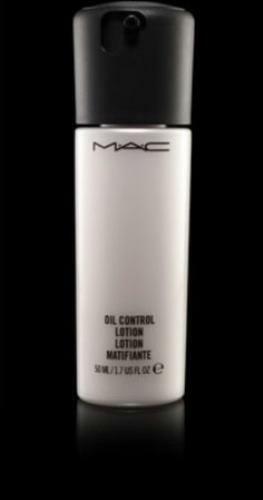 As sad as I was that I was going to have to rely on someone I didn’t know to do my face, Karen created a great face chart for him to follow and introduced me to this magic in a bottle called “Oil Control Lotion” by MAC. See if Karen had come to Mexico, I would not have purchased this gem. But, because I had to duplicate her make up kit which included this magic potion its in my possession. It worked fabulously! Although it was hot, humid and sticky on my wedding day and throughout all of our festivities, I managed to remain relatively shine-free for the whole she-bang. I know that it seems counterintuitive to put make up on in this type of heat, much less a layer of something in between your moisturizer and foundation, but it works! I’d forgotten about this little miracle as I am wont to do when going through my daily paces, but we went to a party at a friend’s house last weekend and it was a little sticky outside. As I was rifling through my make-up kit, my fingers landed on this magical bottle. I had the time to take the extra step and I did. Boy, am I glad I did. I was outside all night, the stickiness did not abate and my allergies flared up un-mericifully. Fun party, but I was a little uncomfortable. By the time I got home, I felt like one hot sticky itchy mess. I looked in the mirror when I got home and was pleasantly surprised to see that I looked exactly the way I did when I’d left 6 hours earlier. Yup, miracle in a bottle! I’ve been eyeing these FAB linen platforms by Theodora & Callum. Theodora & Callum is the brainchild of of Stephani Greenfield (co-founder of Scoop NYC) and Desiree Gruber (co-creator of Project Runway). Theodora & Callum is an accessories-based line featuring scarves, jewelry, shoes and bags inspired by their collective travels. Drawing inspiration from Morocco, Bali, Turkey, India and the Mediterranean as well as the bon vivant mentality of the late 60’s and early 70’s European jet-set, each style feels as if it has been discovered in a far-off locale. 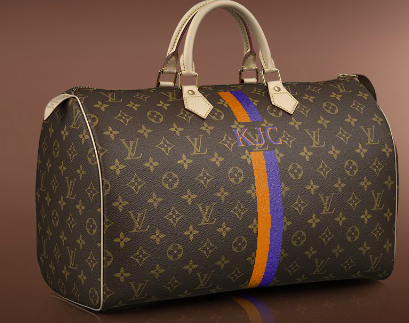 They’re a little pricey at $395 a pop. What do you think? Hot Buns In the Summertime! My signature hairstyle is a chignon (pronounced shin-yon), a.k.a a bun. 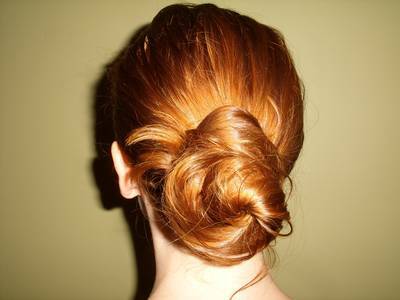 The word “chignon” comes from the French phrase “chignon du cou,” which means nape of the neck. I love wearing my hair in a chignon because it’s neat and I don’t have to worry about my hair not looking the way I want it to. I’ve noticed that the chignon is also the default hairstyle some of my favorite stylistas too – JLo and SJP to name a few. Believe it or not, annually, I spend hours at the hairdresser; I often wear my hair down, but the easiest, and possibly most flattering, hairstyle for me is a chignon. It’s chic and simple: it can be big (add a fall here or there) or small, it can be messy or neat, on top of my head or at the nape of my neck. Since the chignon is my hairstyle of choice, I’m always on the lookout for products that will help me have the best chignon possible. Leave it to the folks at Goody to come up with the Goody Spin Pin for you guessed it, buns. 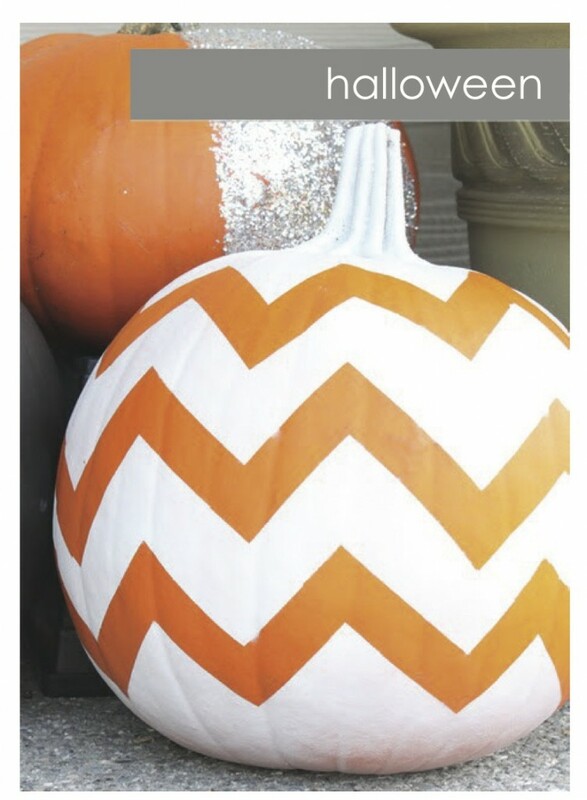 They look a little daunting, but I found this great how-to with step-by-step instructions here. I’m thinking it’s going to be a scorcher this Summer, high temps and thick hair on the nape of my neck do not go hand-in-hand. 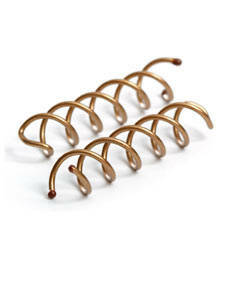 If you’re like me, you might want to check out the new fangled Goody Spin Pin for yourself. Click here to find it. Tell me, which of these chignons do you like the most? 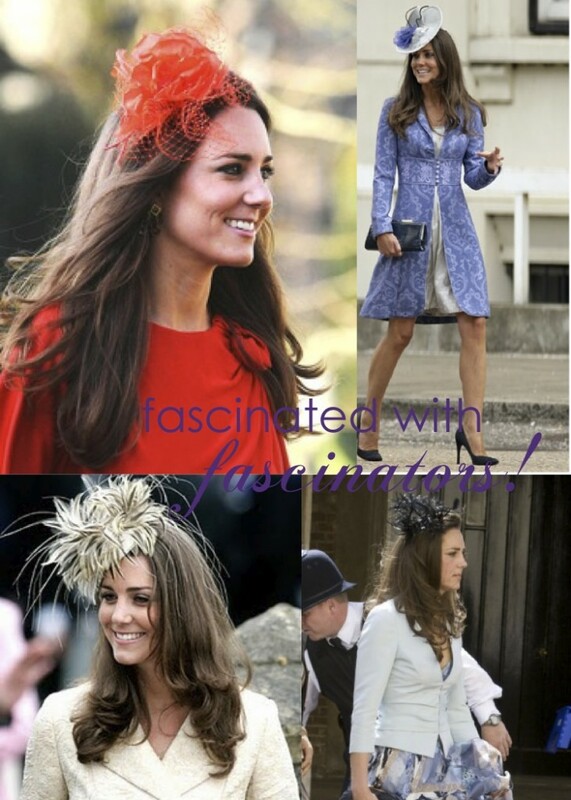 The girl who would be Queen, has fascinated us with her fascinators! Now, by the time this post hits your inboxes, Kate Middleton will be Princess Catherine. And to her credit, she has made a name for herself all over the world not with her designer duds and gaggle of celebrity friends, but with her High Street sense of style. What is a fascinator you ask? A fascinator is a headpiece. A delicate, slightly-to-very frivolous head decoration worn almost exclusively by women. A fascinator may be worn instead of a hat to occasions where hats were traditionally worn—such as weddings—or as an evening accessory. I became obsessed with fascinators a few weeks ago. I needed a hat for a luncheon I was attending and I decided that I wanted one of the cute little numbers Kate Middleton is so fond of donning. If I told someone I was looking for a fascinator they looked at me a bit dazed and confused, but if I told them I wanted a hat like Kate Middleton’s they new exactly what I was talking about. Not bad for someone under the age of 30 (she’s 29) who’s been dressing herself without the aid of stylists and haute couture designers thus far. I’m thinking we might have a style icon in our midst. Only time will tell, but in a short period of time we’ve become fascinated with her fascinators! Want your own fascinator, but you’re not working with a budget fit for a Queen? Check out my foray into the world of milinery on FaceBook. Yes, I fashioned my own fascinator. Hip Hip Hooray for Princess Catherine & Prince William – may their cups of happiness runneth over!